I'm linking up with Craft Buds to share my craft book project. Earlier this year it was our 5th wedding anniversary. As a surprise for my husband I made him this 'Johnny Cash quilt' with the lyrics of our wedding song on it. 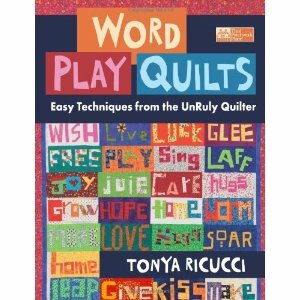 I love her philosophy of unruly quilting and the great way she goes through the different ways of making letters and the fab projects she shows in the book. It's brilliant Lucy. A great excuse to make another ; ) I just finished a baby quilt inspired by that book. Awesome! You know, I have a habit of making throw quilts for our family that are too small for my husband too. So he drags the old ratty blankets out of the closet for on the couch and it drives me nuts. I need to make a quilt just for him, maybe even a twin size. This is awesome. What a fantastic gift and a fab lyric! Love love love this quilt it is so cool! I have a feeling one of these word quilts is in my future. Not yet though...not yet...must finish something first! Oh yes I love a bit of unruliness - off to put it on the Amazon bucket list. I just adore your quilt - we had Bob Marley's Is this Love? at our wedding! this is great, you really mastered that technique. Such a lovely idea for a present. What a great gift and I love that book! brilliant quilt - you did a great job. thanks for the sweet words, I'm glad the book helped.